This profile has been written to give you details of the two parish churches which make up our benefice - St John the Baptist Church, Bere Regis and St Laurence, Affpuddle. We also hope that it gives you the background to the rural communities served by the two churches, in this beautiful area of South Dorset. The Benefice was formed in 1977 after the retirement of the vicars of both parishes. Prior to this, Affpuddle was linked with Tolpuddle, whilst Bere Regis had a long standing daughter church at Winterborne Kingston. The two parishes have independent Parochial Church Councils and are responsible for their own financial affairs and share payments, but are keen to maintain and develop a close relationship on wider spiritual concerns. The Benefice came within the Deanery of Milton and Blandford until 2007, when it transferred to Purbeck Deanery. The individual profiles will supply more detail but, briefly, the Benefice lies in beautiful rural Dorset, roughly half way between Poole and the county town of Dorchester. The parish of Affpuddle (which includes Briantspuddle and the now redundant church at Turnerspuddle) is situated in the chalk valley of the River Piddle. To the north east lies the larger village of Bere Regis, located on the Bere Stream, surrounded by farmland where the chalk downland meets the heathland. The Vicarage for the Benefice is situated, adjacent to the church in the centre of Bere Regis. It is a large family home, built in the late 19th century, first as a private residence and later adapted to its present use. It has a large, walled garden and delightful views of the church and countryside beyond. Bere Regis is in South Dorset, twelve miles west of Poole and a similar distance east of Dorchester, the county town of Dorset. It occupies an important location at the intersection of the two major trunk roads of the county, the A31 and the A35, although a by-pass keeps through traffic away from the centre of the parish. The parish is within the administrative area of Purbeck, and the parliamentary constituency of Mid Dorset and North Poole. The population is around 1,750 and, although now a village, Bere Regis was a market town until the late C19th. The geographical area of the parish is large and includes three distinctive Dorset landscapes : chalk downland in the north, the valley of the Bere Stream in the centre and the sandy heathlands in the south. The parish was formerly composed of three separate medieval manors, and although these have now lost their legal importance, they still have an influence in the significant outlying areas of population, including Roke, Doddings, Bere Heath and Hyde. Part of the centre of the parish is an area called Shitterton, originally one of the separate manors, whose name has understandably attracted wider attention! Dorset is renowned for its unusual place names but Shitterton (changed to Sitterton during the Victorian era, and also by some people in more recent times) is also widely known as an extremely attractive area of thatched cottages, largely untouched by major fires which destroyed much of the centre of the parish in the C18th. Bere Regis has a greater social mix of population and a higher percentage of local authority dwellings than the rest of Purbeck. It retains more of the features of a traditional rural Dorset village, still with a greater link to the agricultural sector, and with fewer numbers of holiday cottages and second homes than for other Purbeck villages. A good range of ages still exists, and a thriving village school, recently changed from 5 to 8, to the 5 to 11 age range, presently has around 110 pupils. The Parish Church of St John the Baptist is a Grade 1 listed building, dating back to the C11th, and it is very likely that an earlier building on the site, probably of wood construction, existed well back into the Anglo Saxon period.  The church is described in vivid detail in Thomas Hardy’s novel ‘Tess of the D’Urbervilles’, with features of the real life and powerful Turberville family who were lords of the manor of Bere Regis between the C13th and C18th. The church is regularly visited by Hardy societies from around the world. The church is a large building capable of seating around 250 people, and, although the exterior of the building is much older, the interior owes much to a major restoration which was completed in 1875. The church is in good condition at present, with the most recent work, in progress as this profile is being compiled, being major repair and maintenance of the six church bells in the West tower. 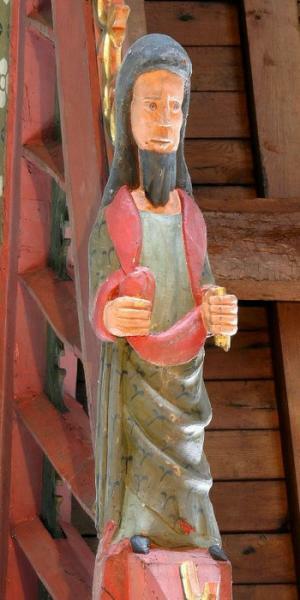 The active team of bell ringers have acted as project managers, overseeing the work. The last Quinquennial survey was undertaken in 2010. The upkeep of the church building is a source of great pride for many volunteers, and, in addition to the bell ringing team already mentioned, there are active groups involved in flower arranging for both weekly services and major festivals, regular cleaners and a team of volunteer tour guides to show visitors around the many historical features of the building. There is no separate church hall but a kitchen area built in to the western end of the South Aisle allows refreshments to be available after the main weekly services, and smaller scale catering for lent lunches, harvest suppers, afternoon teas for visiting parties and other one off events as necessary. The church is open to visitors during every day of the week between 9.00am and 5.00pm, or later if there is a service of worship or other event taking place. The churchyard is no longer an active cemetery with the exception of an area designated for the interment of cremated remains. Much of the churchyard is managed for wildlife. It was awarded a Silver Award in the Dorset Wildlife Trust’s Living Churchyard Project in 2014. 11.00 Holy Communion (Common Prayer/BCP) - Final Wednesday of each month, especially appreciated by older parishioners, who are unable to attend services early on a Sunday morning. These are arranged throughout the year incorporating festivals, Remembrance Sunday and thanksgiving services. During August 2014, a special service took place to commemorate the centenary of the beginning of World War 1. Baptisms, weddings and funerals occur regularly. Sometimes baptisms take place as part of the Family Service. During 2013, there were 15 baptisms, 20 funeral/interrment of ashes/thanksgiving services at the church and 6 weddings. As recently as 2011, there were twelve wedding services during the year. The parish strongly believes that the worship of God, and the feeling of God’s love for us can and should be expressed in different types of service, both traditional and more modern. There are regular services from the Book of Common Prayer for Holy Communion, Mattins and Evensong, and because these are less common in our area, the congregation often includes visitors from other parishes, especially for Evensong. The mid-morning Sunday communion services are taken from Common Worship. At the same time, the monthly Family Service, although based around established parts of the liturgy, uses a different approach with much of the service organised and run by the children and young families of our Junior Church (approximately 30 members). Most strikingly, for the last nine years, the message of scripture has been brought to the congregation, a mixture of all age ranges, by puppet shows with the young children of the Junior Church as puppeteers. Assistance was given by youth workers from the Diocese to help get these services off the ground in 2005 and financial support has been given by a local educational trust. The Junior Church members, including the children, now also perform at services and other events, both in Bere Regis and in other nearby locations. The congregation consists primarily of middle aged and older people from the parish itself, of no predominate social group. The congregation for the Family Service includes a much larger number of children and younger families, but very encouragingly, is also popular with the older church members who also attend the more traditional services. The Church has a fine, well maintained, one hundred year old, two manual organ and is fortunate to have 3 excellent organists. There is a four-part (S.A.T.B. ), robed choir, 7 regular members, which sings at all main services - Sunday morning and evensong, and major festivals which occasionally fall on week days. The choir leads the singing of hymns, psalms, canticles and responses and sings anthems at the Sunday morning services - some "a cappella" and some accompanied. On occasions, when an organist is not available, the choir sing Mattins and Evensong unaccompanied, with the help of a local violinist. The choir is augmented with additional local singers for special services i.e. carol and Holy Week services. There is one lady Licensed Lay Minister (LLM) who regularly officiates at services of Mattins and Evensong, and is also available to preside at funerals and home communions or communion services, if permission or extension was given for the latter. There are two Lay Pastoral Assistants (LPA), available to visit the sick and housebound, and to assist the incumbent with other pastoral needs in the parish.  Junior Church - has over 25 members of all ages and meets in the Church for an activity session with a Bible theme on the Second Sunday of the month at 10am. This is followed by the Family Service at 11am.  Mothers Union – meets monthly and holds services periodically.  A Bible Study Group – meets weekly throughout the year (with a summer break) and studies York and Lifebuilder courses. Fund-raising concerts, art, flower and craft festivals, involving local organisations are organised in the Church, which attract many additional visitors. There are two places of worship of other denominations within the parish ; a Congregational Chapel in the centre of the village, and a Methodist Chapel at Bere Heath which is one of the areas of population towards the south of the parish. Joint services have taken place with the Methodist church as well as other ecumenical projects, such as sharing the special lunches held during the period of Lent to give support to Christian Aid. There are presently 99 members on the Church Electoral Roll. A copy of the last annual accounts to 31st December 2013 is attached. Of the overall parish income for 2013, around one third was from regular donations, with the remainder from sources which are more liable to variation each year. As the regular donations are the most important element of our income, a stewardship campaign was undertaken in 2012 to try and increase not just levels of individual giving, but also the overall amount received from this source. Although this was successful in raising regular donations, there still remains a problem in the ability to pay the total Diocesan Share in full. The total Share paid in 2013 was £24,000 out of a total requested of £29,462. As well as the efforts to remedy this situation, every attempt is made to maximise the other items of income, for example gift aided donations, fundraising and donations from visitors to the church. As an example of the latter, we have a pool of volunteer guides who conduct guided tours around the church, taking advantage of the architectural features and literary connections for which the church is famous. Some other items though, for example statutory fees, are dependent on the number of weddings etc, which were high in 2013. We also maintain separate funds for designated repairs to the fabric of the church, although the levels on these are dependent on the repair work which is needed. At the time of preparation of this Profile, a large repair contract on all six bells in the west tower is being paid from these fabric funds, including donations from fund raising specifically for this work. As mentioned in the earlier information on the parish, there is a school in Bere Regis which takes children in the 5 to 11 age range, which presently has around 110 pupils. At age 11, pupils move to secondary schools in Wareham or Lytchett Minster, both around eight miles from Bere Regis. The church enjoys a good relationship with the village school. Nativity plays and the annual ‘Leavers’ Service are held in the church every year and classes visit the church for music week and other activities. The previous incumbent carried out fortnightly assemblies at the school, alternating with the pastor at the Congregational Chapel. The Parish lies in rural Dorset ten miles east of Dorchester, in a chalk valley, on the banks of the River Piddle. The Parish is within Purbeck and in the constituency of South Dorset, but is very close to the edge of district, constituency and deanery boundaries. The Parish consists of the villages Affpuddle and Briantspuddle together with the outlying settlements at Throop, Turnerspuddle and Rogers Hill. The current Parliamentary electoral roll is 416; including non-voters the parish numbers approximately 450. There are about 220 houses, mainly owner occupied, although there are some 20 local authority dwellings and several holiday cottages. Although originally inhabited by agricultural workers, the villages are now largely populated by incomers who are employed in the surrounding towns, or retired people. The key industries in the Parish are agriculture and businesses associated with tourism. There is also a successful computer software firm operating from offices in Briantspuddle. A number of the original population remain, but very few are employed on the land. However, there is a good mix of ages and a wide range of talents. A single small shop and post office run by volunteers is situated in Briantspuddle which is the larger of the two villages. The main form of transport is by car, as public transport is somewhat limited and there is an infrequent bus service to Dorchester and Poole. There is an hourly train service during the day from the local stations at Wool and Moreton, direct to Weymouth, Dorchester, Poole, Bournemouth, Southampton and principal stations on the main line to London (Waterloo). Affpuddle, although once the larger village, contracted in size over the course of the C20th and is now, in effect, a hamlet consisting of approximately 30 houses; several are listed buildings dating from the C16th, C17th and C18th and the remainder mostly built in the second half of the last century. As Affpuddle shrank in size so Briantspuddle expanded in the 1920s under the sympathetic patronage of Sir Ernest Debenham, who was the then owner of the surrounding estate. Following his death in 1952, the estate was broken up and many of the cottages were bought by sitting tenants. However, three of the farms in the Parish are in the possession of his descendants. Many of the cottages and farm buildings in the Parish are now listed. There has been very limited new development, mainly in the form of infilling and higher cost housing. The village hall, recently extensively refurbished and partially rebuilt, is based around a converted Grade 2 listed barn in Briantspuddle. The Parish Church of St Laurence, Affpuddle, is a Grade 1 listed building largely of C13th origin, but extensively restored over the last 150 years. It is capable of seating a maximum of 120 people. 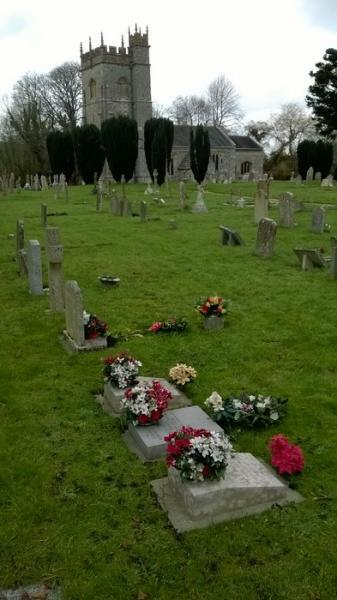 Both the interior of the church and the large churchyard are well cared for by volunteers, who have rosters for church cleaning, flowers and churchyard mowing. The Church is in good condition structurally. A quinquennial survey was carried out in July 2013 and although a number of relatively minor structural repairs were recommended, and are in hand, there were no defects of major importance. The churchyard is still an active burial ground. A second-hand Bebington organ was installed in 1999 to replace the organ presented by Sir Ernest Debenham in 1939, which had become unserviceable. There is a small vestry and kitchen at the western end of the church. In addition to its own Norman font, the church for many years housed a second font which had been removed from the redundant church at Turnerspuddle after the Second World War, during which that church had been seriously damaged by a German bomb. This font was recently returned to the redundant church at Turnerspuddle and the Affpuddle font restored to its original location inside the south entrance to the church. There are no other licensed places of worship in the Parish. The church at Turnerspuddle has been declared redundant and has passed into the custody of the late Sir Gilbert Debenham’s family. Services are generally middle-of-the-road churchmanship with no extremes. The hymn book used for Parish Communion and Mattins is ‘Hymns Old and New – One Church One Faith One Lord’. During the year to August 2014 there were 6 funerals 1 baptism and 1 wedding. The congregation consists mainly of middle-aged and retired ‘professional’ people, with some younger families. There are no churches of other denominations in the Parish. Over the past five years Parish income has remained fairly static as have the running costs of the church. Our main problem is that the funds available after we have paid our costs are insufficient to pay the Diocesan Share in full. (We did pay in full in 2012 and should be able to do so again this year). Most of our income comes from Gift Aid standing orders and weekly envelopes together with loose plate collections and Vicar’s fees. In addition we have coffee mornings, cream tea afternoons and a stall at the village Christmas Fayre which all help to swell the coffers. The Church also has around £25,000 in a designated fabric fund account to meet any repairs that are necessary. There is one Lay Minister with “Permission to Officiate” in the parish. He organises non-eucharistic family services when required although these are not currently held regularly, and is available to preside at funerals, home communions and communion by extension if needed. He arranges the annual carol service which includes choral support from a local choir, and also Advent and Lent courses, leading the study sessions in turn with the incumbent and other members. There are two lay pastoral assistants who visit the sick and housebound and liaise with the incumbent on other pastoral needs. One of the LPAs is also the Sacristan and the other is the Archdeaconry LPA Officer and participates in the diocesan LPA support group. A lay member compiles and publishes the weekly pew sheets. He and the lay minister are also the current Deanery Synod representatives. Rotas of laity, duly trained and authorised where necessary, assist in the administration of communion, lead the intercessions, read the lessons, serve refreshments after parish communion services, and undertake duties as sidespeople, church cleaners and flower arrangers. Lay people organise the annual fete and coffee mornings etc for fundraising purposes, and also the harvest lunch. A home group for bible study and prayer operated for some years but has lapsed in favour of the Advent and Lent courses mentioned above. Each year the PCC selects particular charities to be supported. Regular recipients are Christian Aid, Embrace the Middle East, supported with the carol service collection, the London City Mission, who send a preacher in the autumn in alternate years, and the Cheshire Homes Foundation in Dorchester. Two members of the parish have also worked for a mission organisation in Nepal. and collects their fees. There is no school in the Parish. Children are transported by bus to church schools at Puddletown or to other schools in Dorchester. The incumbent visits Puddletown schools on an occasional basis. Its production and delivery is done voluntarily and the printing is funded by advertising revenue and the cover charge. The remaining profit goes towards church funds. Copies are available on request or it can be viewed digitally on the village website - www.bereregis.org, following the links to parish magazine archives and selecting the appropriate year and month. We are very fortunate that the webmaster has managed to upload copies of the magazine dating from the first copy in 1887!!!! The churches website is at www.bereregiswithaffpuddle.org.uk.